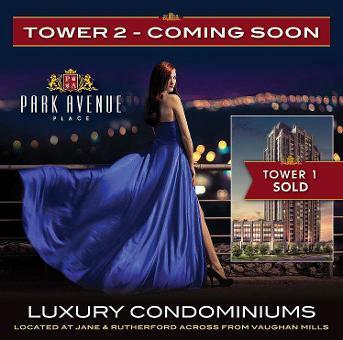 PARK AVENUE PLACE CONDOS TOWER-2 OPENS NOW - GREAT OPPORTUNITY TO LIVE & INVEST IN VAUGHAN!!! Welcome to Park Avenue Place Condos, Vaughan an extremely inspiring new condo project by Solmar Development Corporation located at Vaughan Prime Location, South East corner of Jane and Rutherford, walking distance from Vaughan Mills Shopping Center, Canada's Wonderland, Vaughan Future Hospital and only 4 km away from Vaughan upcoming Subway, TTC on door step just a few minutes away from many attractions in the City of Vaughan, Rutherford Go Station and and easy accessible to York University and University of Toronto. Close to major highways hwy-400, hwy-407, hwy-427 and hwy-401. The project in pre-construction stage and will be ready for living by September 2016, Comprising of approx 1000 condo units in total with three residential towers - 25-storey (South Tower) 7-storey Office Building. The project will provide a mixture of residential condominium units, commercial office space and large and small retail spaces. Where style meets comfort, choice meets convenience and all the best things in life come together. 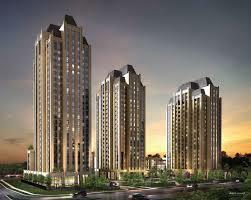 Welcome to the new vision of condominium living in the heart of Vaughan. Park Avenue Place Condos will be a dramatic new addition to the Vaughan City and an exciting gateway to the emerging new City Of Vaughan. Combining the finest in next-generation, sustainable condominium living with opportunities for spectacular shopping and diverse commercial choices, Park Ave Place aims to redefine the way people live, shop, work, play and entertain in Vaughan. Announcement: PARK AVE PLACE - JANE STREET AND RUTHERFORD ROAD Vaughan. After successful Sale of Tower-1, Exclusive VIP Broker Registration is open now for Tower-2, Sale will start from mid of February 2015, In ordr to purchase prime units and take advantage of Special VIP Broker Pricing & Incentive "Register Now"
Registration is open now for VIP Broker Preview pricing and incentives. If interested Must Register as soon as possible using the attached form. Prime location Units are limited applications will be considered on first come first basis. For more information about building features, Floor Plans and VIP price list Kaleem Salahuddin @ 416-992-9860. 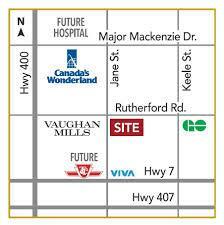 *PARK AVENUE PLACE VAUGHAN* GREAT VALUE AND INVESTMENT OPPORTUNITY IN VAUGHAN CLOSE TO VAUGHAN FUTURE SUBWAY!!! Note: All prices, figures, sizes, specifications and information are subject to change without notice. E. & O.E. All areas and stated dimensions are approximate. Actual usable floor space, living area and square footage may vary from stated floor area. All illustrations are artist's concept only. Furniture is depicted for illustration purposes only and not included. The unit shown may be the reverse of the unit purchased.